After the heavy rain a week earlier, returning to the AT north of Doyles River, where we worked a month earlier, seemed a good idea to see how things worked, and to complete maintenance and remodeling of drains. To ensure she would be home in time for guests, Marit Gay went to her section of trail, joined by Eric Christenson, both of whom have made major contributions to the trail section the rest of us went to. The day almost fizzled when I did not have a toolbox key with me, but Marit showed up with a key. This month I took a shovel after last month’s experience. 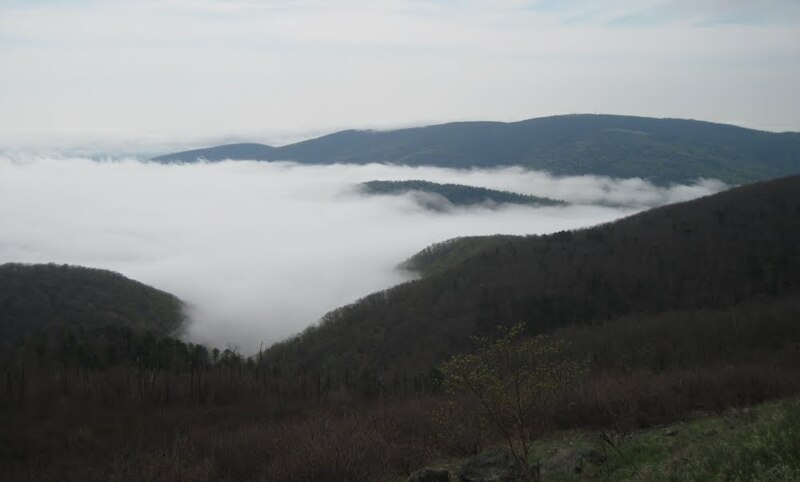 AS we drove north, we stopped to look at valleys east of Skyline Drive filled with clouds as shown in the picture taken by Don Davis. On the trail, we noticed some sloped sections of trail, waterbars and grade dips which needed a little cleaning or remodeling after last month’s work. I stopped to pull some fresh bittersweet growth from a patch where we have cut and pulled large vines in the past. Then we saw some drains which had an impressively large amount of material caught in the run off sections, and a badly eroded section of trail, despite grade dips uphill. Eileen Seaman took the lead in filling the holes in the trail with reclaimed soil, while Don Davis opened up the openings to the run offs. Eileen also cut some logs which obstructed the run offs. Then Don found why the erosion occurred. One drain sent water to the west of the trail because the east side was higher than the trail. However, the water soon found its way back on to the trail to cause erosion. Don directed the movement of a log and debris to send the water away from the trail, and dug a new drain to get water of the trail. After lunch we improved some other drains which had run water off the trail, and finally moved past the overlook where we often stop. After reopening several more drains, I decided it was time to go after another productive day trying to slow down erosion of the AT. This week’s planned hike up Old Rag had been carefully scheduled well in advance, hoping to beat the crowded conditions found later in the spring and to enjoy one of the few remaining weekends where vegetation does not obscure views. In the days leading up to the hike, however, the weather forecast failed to cooperate...in fact it became ever more dismal as Saturday approached. Concerned about slippery wet rocks on Old Rag’s Ridge Trail under such conditions, by midweek hike leader Ken Moss was soliciting input from other Chapter leaders for their opinions on the situation, with the unanimous consensus being that Old Rag should be avoided in such conditions. By Friday night the National Weather Service was calling for a 100% chance of precipitation, heavy at times, with thunderstorms, windy conditions and a flash flood warning thrown into the mix for good measure! A slim glimmer of hope always exists when predicting the weather, but by Saturday morning, with rain already falling and radar indicating no relief in sight, the die was cast and the hike leader pulled the plug on any wishful thinking about conquering Old Rag on that day. As the Chapter’s unofficial credo is more or less that we hike “rain or shine”, and not daring to run counter to such a glorious and hard-earned tradition, the hike leader’s task was now to determine an alternate hike that would avoid the hazards inherent with hiking Old Rag (slippery rocks and exposed ridgelines prone to lightning strikes) as well as avoiding trails which may have problematic stream crossings. While initial consideration was given to an alternate hike in the Old Rag vicinity, such as Nicholson Hollow, Corbin Mountain or Robertson Mountain, a note from frequent hiker Brad Young on Friday night suggested the simple choice of the trail system around nearby Ragged Mountain Reservoir. Though he had never actually hiked these trails previously, this sounded like a reasonable alternative to Ken, who then did some research online to find driving directions and print out a trail map. 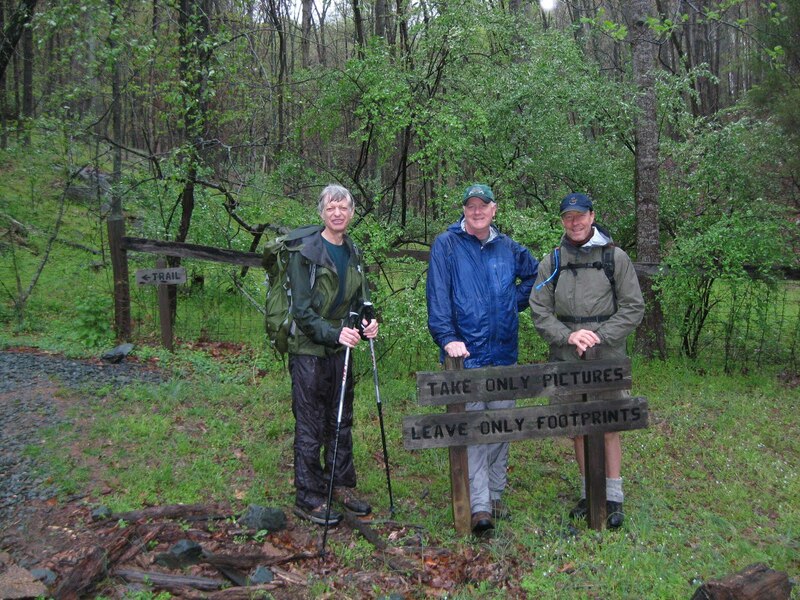 With a steady rain falling as he drove toward Albemarle High School, the hike leader wondered if anyone would actually show up for what promised to be a wet day. Upon arrival, with some sense of amusement, he found Leon Gorman, Bailey and John Shannon already there, soon followed by new PATC member Stuart Brown, who would be making his first hike with us. I explained the situation and it was agreed to proceed to Ragged Mountain. Leon decided that it would be best not to expose Bailey to the wet elements and opted out in favor of returning to a dry, safe home. Our remaining three adventurers then drove to Ragged Mountain. The rain continued to fall upon our arrival, so rain gear was donned and final packing accomplished before heading out on the trail…during which the trail map was embarrassingly left behind in the car. After heading out on the trail to the left of the parking lot, following John’s suggestion (he had hiked the area years ago), we walked along a dirt road for a bit. Ken soon realized he had not turned his GPS on (used primarily to record hiking tracks for a personal database rather than for navigation), but as it was likely deep in his pack and not wanting to stop and search for it in the rain, he decided to just forego recording this hiking track. The small group soon merged onto the actual trail system and headed toward the Upper Lake loop. This proved to be a pleasant walk up and down through the rolling terrain, leading us by fine views of the lake and dam. Upon arriving at a trail junction, we elected to continue to the left, taking us around the western end of the reservoir. After about an hour another trail junction caused some confusion, when it was realized that the trail map had been left behind. Finally pulling out the GPS to figure out where we were, we proceeded in what appeared to be a logical direction (though the GPS did not show the trail system on it’s internal map). The rain seemed to come and go as we walked through the woods, with occasional gusts of wind which caused us to button up our rain gear from time to time…but at other times there was a reprieve. During one of these rain lulls, we enjoyed a nice view of both the Upper and Lower Lakes while crossing the dam separating the two, commenting on the unique color of green displayed in early spring as tender new leaves begin to emerge. Nevertheless, the conditions were sufficiently wet enough for the hike leader to discover that the Gore-Tex lining in his boots had failed, providing a not so pleasant squish with every step. Another trail junction caused further confusion and we again chose what seemed the logical direction. Before long, though, we realized we were back on the trail to the cars and just gave in to the inevitable. We had already been on the trail for two hours and determined that to be sufficient for such a wet day. Upon returning to the car, Ken noticed that the ink on the infamous forgotten trail map had smeared almost beyond recognition from the small amount of rain it had previously been exposed to…it would have quickly become useless out in the conditions we experienced. All in all it was a good day with pleasant company. We shared interesting conversation on a range of subjects as we walked along and by the end of the trail could all feel the satisfaction of having challenged both ourselves and the elements. The overcast sky, with possible rain, probably kept the number of people at our meeting place to 7. So not long after nine, I decided there was no point waiting for other people. As predicted, there was fog on Afton Mountain, which slowed us a little, but then we saw a notice of an accident ahead, I diverted through Fishersville, unnecessarily it turned out. Michael Seth met us at the trailhead, which is high enough to be foggy. We set off, hoping for clearing. Despite the cool conditions, most people removed some clothing to avoid sweating on the climb. At 1 pm we reached the top and had an excellent view of fog. It seemed to get thinner, but did not clear, even with a cool breeze. One hiker was quite impressed with the new (to us) chocolate and orange cake, and hot chocolate. The downhill return was as foggy as the morning to finish a day everyone enjoyed. 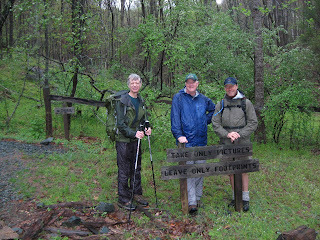 A cool, overcast day may have kept away some people who had expressed an interest in helping maintain trails today. However, Pete Fink and Bev Maresca showed up, as did Andy Willgruber who had observed some fallen trees on the road to Little Calf Mountain. Andy set off by himself while the rest of us made a stop at the Rockfish Gap toolbox. Here I made a poor decision to take 3 McLeods and no shovels, based on thoughts of regrading rather than what we actually did. Pete used his saw for the first time in cutting a large bittersweet vine. The goal for the day was cleaning, remodeling and possibly creating water drainage structures of this section of trail whose overseer is long time member Connie Wright. A week earlier, I walked most of the section, finding that existing waterbars needed cleaning. So we started cleaning some existing waterbars, remodeling some recently created runoffs made by putting some outslope on short sections of trail. Soon I realized that Pete and Bev did not need any direction in cleaning or remodeling of water control structures, most of which are a waterbar-grade dip hybrid. In addition to clearing out recent debris and vegetation growth in runoffs, we widened the entrance to the drains in the hope of getting water off the trail without having to make a sharp turn, and dropping debris on the trail. Digging we did in previous years made opening the runoffs easier than it might have been. If I had taken Pete’s advice and brought a shovel, it would have been even easier. As usual, one of the problems clearing runoffs were the briars which pricked us when trying to clear debris, and the mats of grass in the runoffs, which showed that trail maintenance is a holistic task. Some of the tasks for maintainers are treadwork- moving earth and rocks with McLeods, picks and perhaps shovels; vegetation trimming; blowdown removal; invasive plant control. Today they came together. Some run offs were blocked by fallen tree, others by mats of stilt grass (a prolific invasive weed), other by briars which in one spot also protected some bittersweet vines which were strangling a tree. If we could stop the invasive plants, treadwork might be easier. As we neared an overlook, I suggested we had done enough for the day, which was by now one of the longest work trips I have had. On our return, I counted 47 water diversion structures, which I thought was an impressive effort. In the future, they will need cleaning again, and clearing of overgrowth, and possibly more remodeling, but this day’s work will make that easier to do, and easier to see what else could be done. Andy Willgruber reported a successful trip to Little Calf Mountain, meaning the road to the top is drivable so summer mowing can be done. 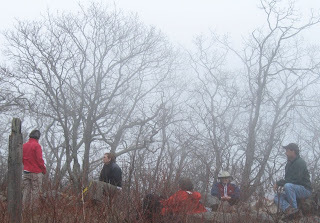 Iva Gillett and Marit Gay co-led the group of 14 hikers on April 2, 2011 to Hawksbill Mountain and Stony Man. We met at AHS and caravanned with four cars up to Thornton Gap. As we were driving on Skyline Drive we were in a cloud of snow flurries. 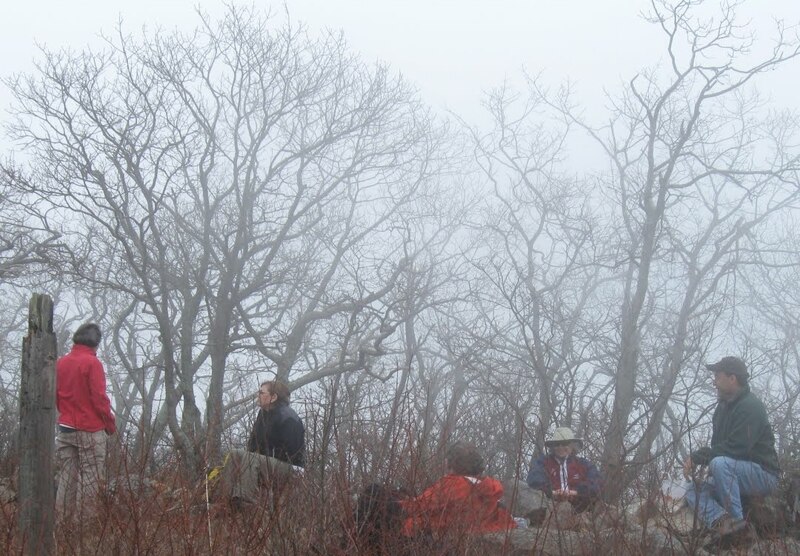 The weather did not deter our plans, however, as we first went to Hawksbill Mountain to hike the 2.9 mile trail. The group enjoyed the circuit hike on the Appalachian Trail, Lower Hawksbill Trail and Salamander Trail. We had a variety of weather from sunshine to snow and hail. John Shannon and others took some time out to cut up a large tree blow-down on the path. Then we continued to the summit. The view of the Shenandoah Valley was spectacular from Hawksbill Mountain, the highest peak in the Shenandoah National Park at 4,050 feet. With snow on the ground, wind, and cold temperatures we were ready for lunch at Skyland after completing the first hike. We enjoyed the meeting area off the lobby to have our meal and warm drinks from the restaurant. Dennis Templeton started a fire for us in the beautiful, stone fireplace. We were quite cozy! Leon Gorman, Bailey, and Wanda Hamlin departed from the group after lunch to return home. The remaining 12 hikers began a 3.5 mile loop by first ascending Stony Man, the second highest mountain in SNP at 4,010 feet. We had a wonderful view of the valley, including incoming clouds of snow and hail showers. We continued to the mountain of Little Stony Man. A large group of students from the College of William and Mary were rappelling on the cliffs, so we stopped to watch and catch the view for a few minutes. At this point we continued on the AT until we intersected the Passamaquoddy Trail. Ice on the rocky descent made for some careful stepping, but no casualties occurred. Beautiful dripping ice formations lined the trail. We proceeded back to the parking area via the horse trail. It was a wonderful day of hiking and the group also included John Brant, Marian Styles, Don Davis, Brad Young, Liz Lyons, Barbara Shenefield, Bev Moresca and Pete Fink.